Lord Shiva said. “My dear Parvati, now I will relate to you the glories of the Ninth Chanter of Srimad Bhagavad-gita. When everyone gathered there heard the words of the goat, they became curious, and that brahmana inquired with folded hands, “how did you become goat? In your previous life, which caste did you belong to and what activities did you perform?” The goat replied, “Oh, brahmana, in my previous birth I was born in a very pure brahmana family and I very carefully performed all the ritualistic activities enjoined in the Vedas. One day my wife wished to worship Durga, so that our child might be cured of his disease, for this purpose she requested me to bring one goat. When we sacrificed the goat at the temple of Mother Durga; the goat cursed me, “Oh, sinful, lowest of all, you wish to make my children fatherless. 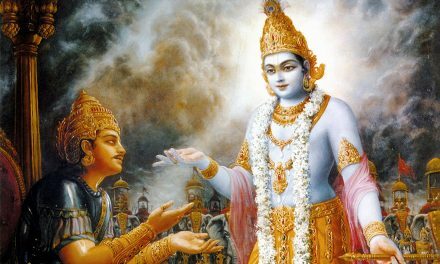 For this reason you will also take birth as a goat.” Oh, Madhava, when the time for my death came I attained this body of a goat but by the grace of Lord Govinda I can remember my previous births. If you wish to hear one other interesting story then I will tell you. 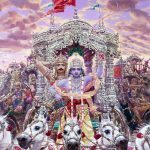 In the place known as Kurukshetra which is capable of giving liberation, there once lived a king of the name Chandrasharma, who was in the dynasty of the sun-god. 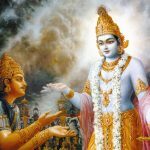 Once, at the time of the solar-eclipse, the king wished to give charity to one brahmana. Included in that charity was a Sudra, whose body was completely black. After going with his priest and taking bath in the sacred lake, putting on clean cloth and applying sandalwood, he returned to his place. With devotion he gave charity to a qualified Brahmana. 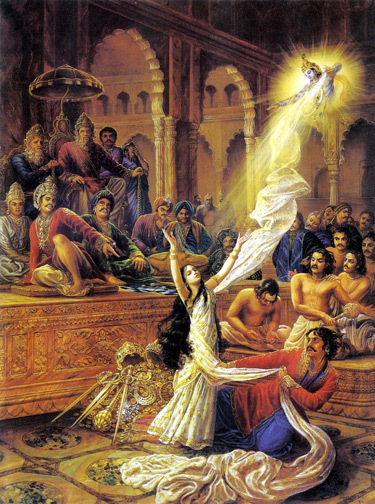 After he had presented the charity, all of a sudden from that black Sudras’s heart, one very sinful chandala (dog-eater) appeared and after a little while, a female chandala appeared from that black sudras’s body, and together they went close to the brahmana. All of a sudden they entered in to the body of the brahmana. 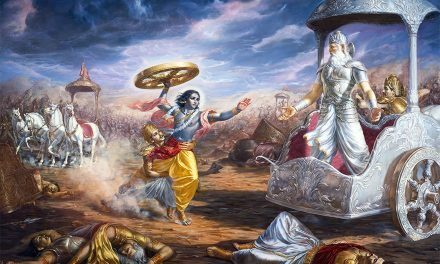 That brahmana remained undisturbed and started to chant the Ninth Chapter of Srimad Bhagavad-gita, while remembering Lord Govinda. The king witnessing all these activities was stunned, unable to say anything. 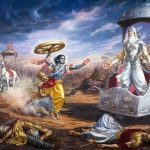 As soon as the words of the Ninth Chapter of Srimad Bhagavad-gita came on the lips of that brahmana, the Vishnudutas appeared there and chased away those two chandalas. At that time the king inquired from the brahmana, “Oh, learned one, who were those two persons and which mantra did you chant? Which deity did you remember?” The brahmana replied, “Taking the form of a chandala, sin personified appeared, along with offense personified in the form of that female chandala. 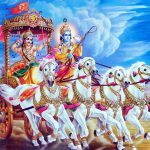 At that time I started chanting the Ninth Chapter of Srimad Bhagavad-gita, which is capable of releasing one from all fearful situations. 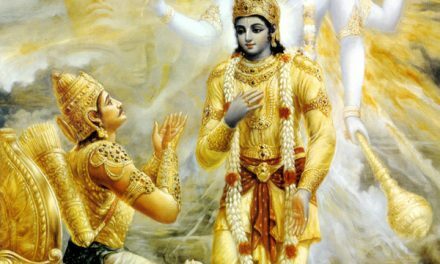 By reciting the Ninth Chapter of Srimad Bhagavad-gita, I am always able to remember the lotus-feet of Lord Govinda”. In the original Sanskrit verse there is no mention of Sudra being offered as charity, instead Kalpurush is mentioned. I have checked the authentic translation by Shri N.A. 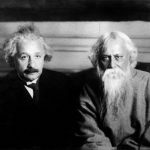 Deshpande,1954 & 1956 as well as compared literal bengali translation with the Sanskrit verses. Please avoid unwarranted casteist statements.